Your yard is full of building waste from the reconstruction of your property? So why not benefit from our professional rubbish removal Bromley BR company. Better Cleaning Company offers reliable and affordable home and office, after builders & garden waste disposal and recycling. Call 020 3746 3201 or fill in online request for a cost-free viewing for an exact price quote now! Our hassle-free rubbish collection service is completed by specially prepared, trained specialists. They are all vetted and fully insured. 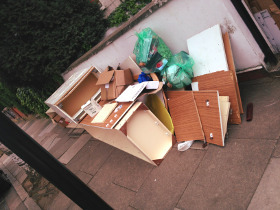 Don`t hesitate to ask for an advice or talk about the waste disposal in Bromley with the operators until they find the most effective solution for you. It`s their job. Note that the service is first quoted, because neither the cost nor the duration is fixed. The junk removal specialists come to examine the house – loft, garage, apartment, home, basement, commercial IT or Tyre building, stockroom, etc – to see its size and to check the volume and the variety of the rubbish. Then, the cost is set and the date for the junk removal is decided. When you agree, the removal operators are ready to take action ASAP! If your backyard needs cleaning up from grass, leaves, twigs and tree clippings or other garden repair waste, we can offer you affordable and reliable garden waste collection Bromley BR. Our rubbish collectors are skilled and equipped to collect, load and dispose of your waste speedily and at a good price. We deliver professional green waste removal, brown waste removal and squander recycling to all local individual and enterprise residents. Better Cleaning Company is an expert cleaning and junk removal company in Bromley with a very delicate strategy to every single individual customer. We are consistently devoted to the personal needs and requirements a client comes to us with. This is the reason why our removal services are always so effective and popular. Organizing removal for you will be completely carried out to your deadlines, desires and administrative demands. We will certainly pack the baggage for you and we will provide you even the packing items. We will find man and van for the transport and will be very mindful for your personal valuables - specially for fine art, important items, decorative home furniture and hand-made interior items. In all circumstances we secure not only the packing process, but also the suitable boxes arrangement through the traveling. If you demand individual removal support - like tickets, temporarily accommodation or administrative assistance with the removal, we can assist you, also. If you decide to get our high quality rubbish removal services Bromley BR, you need to contact our 24-7 phone line 020 3746 3201 or submit an online booking form for a free viewing or directly getting our service. Better Cleaning Company ensures a quick arrival of our seasoned two men teams at your doorsteps. They will check the volume of the waste materials, and will give you a price quote immediately. Collection and loading will begin immediately after that. As a licensed rubbish waste carrier we at all times do the recycling on your behalf.